While the distance to the new airport is significant, I have always maintained that connectivity to the airport was not a major problem. I left Koramangala at 08:30am, driving my Hyundai i10. I was at the airport terminal by 09:45am. Despite maintaining a comfortable pace, I encountered a hair raising experience with a pedestrian running across the highway. The many policeman on the road, were just bystanders, enjoying the life and death drama. I have voiced my concerns about a lack of pedestrian over-bridges in an earlier article (read article), and I am informed that there is on average 1 major accident or death everyday on the NH-7. I was met at arrival by a very senior official of BIAL. I am deliberately keeping his name confidential, but I extend my thanks to him for all the courtesy. While he went to the CISF security office to arrange an apron pass for me, I went ahead with check-in. Two of the departure doors were manned. The CISF guard checked my ID card (which CISF in Mumbai did not bother with, on my return leg). The check-in hall was quite empty and there was a small check-in queue. The folks at Kingfisher are very efficient. I did notice, that most airlines logged in to the CUTE terminals, and hence the stations displayed their airline, but did not staff them. I was informed that the morning peak period was over. Met up with the BIAL official and we proceed up the escalator, and through the security check. CISF have implemented a past suggestion of mine to use 1 DFMD to service two physical check stations. We both expressed exasperation at the CISF insistence on using DFMDs, since there was a 100% physical check and frisk, which renders the DFMD check redundant. But then the Bureau of Civil Aviation Security is not known at the sharpest knife in the already dull bureaucratic block. Also, all the women’s lines were on one side, and there were hardly any women. So while men were waiting, the CISF female lines and guards were sitting idle. I have suggested to CISF in the past to have a mixed line for the women. i.e. one DFMD serving one female check station and one male station. After leaving my carry-on bag in the BIAL official’s office, we went down to the departure baggage make-up area, and it was a hive of activity. It is still is capacity constrained, a weakness in BIAL capacity. At the tarmac we could see all the vehicles buzzing around. The worst were the old, decrepit tractors of Jet Airways and Indigo. I was informed that these polluting tractors were not permitted inside the baggage area. So they bring the luggage trolleys till the building entrance and then the electric tugs take over. BIAL has imposed a July 31st deadline on removal of these smoke belchers. I can understand, why BIAL is upset at the airlines’ insistence on doing their own handling. A lot of duplicated equipment was cluttered all around the tarmac lying mostly unused. I also discovered one of the main causes of the chaos that plagued the airport during its first week of opening (which I subsequently confirmed through other sources at the airport). Apart from the un-preparedness of Globe Ground (GG) and AI-SATS, a major contributor was India’s “largest airline”. This airline did not sign-up with any of the ground handlers, and thought they would do it themselves. 24 hours before the airport opened they realised they would be unable to, and pressured one of the ground handling agents to do the handling. Net result, insufficient and untrained staff, major disruptions and heaps of misery on everyone. 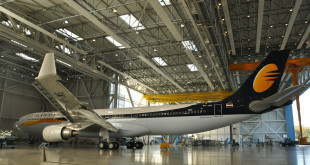 The official had to go and welcome Kingfisher’s first Airbus A330 VT-VJK (read story)which was arriving. So he escorted me to the elevator and soon I was back in the departure hall. The departure lounge was fairly empty. With seating available. Restaurants and shops were buzzing. The restrooms are small, with acceptable cleanliness. I chose to look around, and chat up with the airport staff, and ask them their opinions. They all felt that the airport is slowly coming around. It is still not a great place to work in, but significantly better then when it opened. Their daily commute of about 80km was the biggest source of displeasure, despite the free transport provided by their employers. Most airlines are experiencing a steep drop in regional passenger traffic. Flights to Chennai and Hyderabad, which used to be packed, now carry only about 15~20 passengers. There was a sense of despondency. The FIDs (Flight Information Displays) still need improvement. They are too small, forcing passengers to get really close to read. And they are still only in English. No Kannada or Hindi. Observe the speakers. If you recall, in my visit report before the airport opened, I commented about the microphones at each gate, that would provide localised boarding announcements. Boy, was I wrong. Every little detail of every flight is blared over the speakers. Coupled with the poor acoustics, it is not a pleasant experience. BIAL should force the use of the “local” gate announcements concept. Many departing passengers took time to grab something to eat. The long trip from town, does make you hungry. The restaurants offers decent food, but other passengers told me that RGIA Hyderabad food was significantly superior. The incoming flight was about 5 minutes late, and the aerobridge operators took some time to attach, but the Kingfisher staff rushed the Globe Ground staff through their aircraft turn around, and we were boarded and took off on time. A short taxi, and soon we were airborne. The departure experience was good. Most of the issues have been addressed, corrected, and operations stabilised. We landed without any delay. For some reason the aircraft was not exited on a rapid exit, and so we went for a long taxiway tour of the airport. After parking at a remote bay, despite almost a month since the airport opened, the Globe Ground crew took several attempts to attach the truck mounted ladder. I thought they would have become proficient by now, but obviously they need more experience. I was informed that airlines preferred remote bays to “contact” (aerobridge) gates, since the aerobridge operators took even longer to attach. We were brought to the terminal in a combination of Ashok Leyland’s version of the Cobus, operated by Globe Ground, and Vayu Vajra Volvos. Due to the layout and regulations of the apron, we had to take the royal tour. This also explains why the bags take about 15 minutes to come. We arrived to see a cleaning machine busy cleaning the floors. The airport looked bright and like a shining jewel against the darkness of the night. The baggage came within 5 minutes of our arriving at the terminal. Passengers collected their baggage and dispersed within 10 minutes of our arrival in to the terminal. Good show by Globe Ground and Kingfisher. On the international side, things were not so good. This scene is when only the Singapore Airlines flight has landed. The main crush of European arrivals had not yet arrived. The bags were coming very slowly. Obviously the Customs X-Ray inspection of incoming bags was slowing things down. After exiting the baggage claim hall, I walked across till the glass divider, and peeked in to the departure hall. Compared to my departure, it was quite full, with all the international passengers waiting to check in. On exiting the terminal, one is immediately confronted with the familiar line of drivers with the name placards waiting for their guests. Private taxi drivers lurk like hungry wolves waiting to pounce on arriving passengers en-masse and offer “taxi” services. In the absence of any city police, the BIAL employees were powerless to prevent this predatory and unwelcome practice. I could not find a single policeman at the airport. Only CISF, and their authority stops at the terminal door. There was a reasonable line of passengers waiting at the departure doors to enter the airport, and many passengers who apparently arrived early took the time to occupy the seating outside the terminal meant for visitors. Others took to sitting on the concrete pillars and catch-up. Cars were parked three deep on the drop off lanes, till the parking contractor’s van came with its siren blaring forcing them to move. I headed out to the Vayu Vajra stand, still being accosted by offers of “taxi service”, and the bus stand stood out like a shining beacon. The bustle knocked the picture, my apologies. An oasis of light in the desert of darkness from the bus stand. The BMTC bus drivers were very helpful, and there is schedule chart. I observed that there is an over abundance of service to Hebbal. Also there are only VV services to Hebbal, Electronics City and Kempegowda bus stand. No economical Suvarna service to these 3 destinations. I just missed my VV back to Koramangala, and would have to wait another hour for the next service. So I trudged back to the terminal, and linked up with the AirLift folks. It was a slightly long walk to the P1 parking, past the bus stand, but I was soon in a comfy Toyota Innova, one of 50, and zipping back to town. My fellow passengers were Major Kapoor (now retired and running a team building education service), and Dr. Balaji (an ENT surgeon and now a tele-medicine expert). During the trip I sought their views. Like me, they both felt that BIAL has improved significantly, including bathrooms. They also felt that Hyderabad RGIA,was far superior to BIAL, in almost all aspects. Unlike RGIA, BIAL shows effects of cost cutting, which according to Major Kapoor makes “BIAL lack the ‘feel good’ factor of Hyderabad”. Comparisons aside, I am highly impressed by the improvements at BIAL. Without doubt, BIAL terminal is a superior product compared to the AAI terminal at HAL, and a facility Bangalore can be proud of. While there are areas, like ground handling and cargo, which require improvement, all the operations teams at BIAL and stake holders can be rightfully proud of their hard efforts, and its results at the airport. The total crash in regional traffic is alarming, and it will behoove BIAL to consider operations at HAL, in a larger public interest. 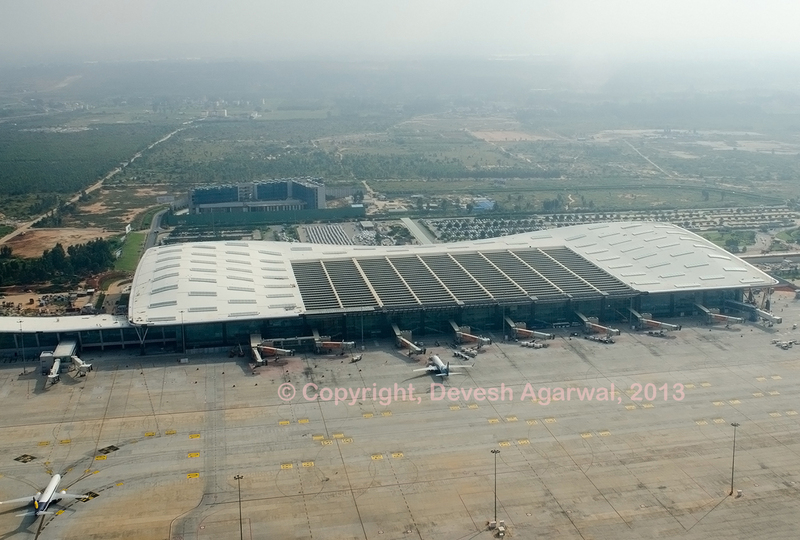 The Governments of India and Karnataka, should strongly consider letting BIAL and AAI continue their partnership, and together they can operate the terminal facilties at HAL airport, while letting the hyper-efficient HAL ATC operate the air traffic, giving Bangalore, the best of both worlds. All images are my copyright. The web album is here.